This is a lovely light dinner, full of flavour from the lime and coriander. Try it for a quick weeknight dinner with your favourite noodles. Cut the florets off the tenderstem royale and set aside. Cut the stems into 2-inch sections, then halve or quarter them lengthways (if you leave the stems whole, they take much longer and the florets will cook faster than the stems). Mix the lime juice, soy sauce and fish sauce with the sesame seeds. Taste and add more lime juice as needed and set aside. Heat the sesame oil in a large wok. 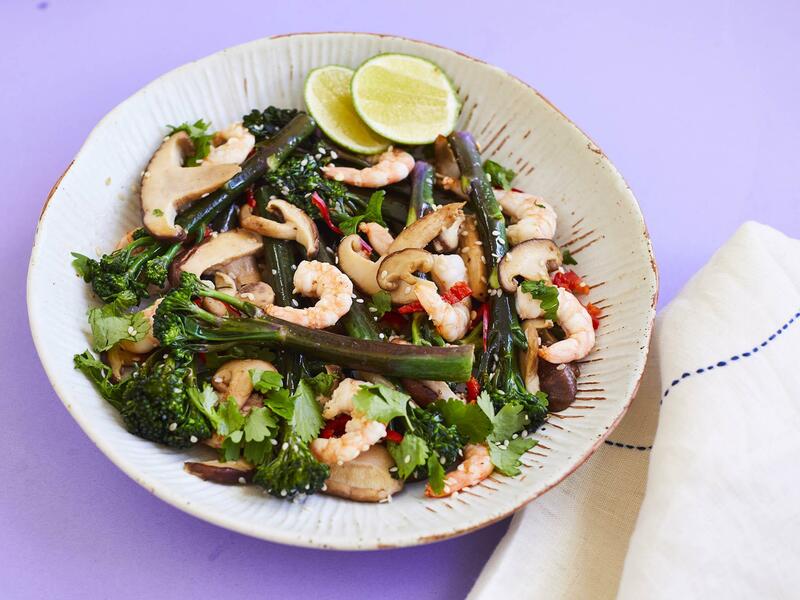 Add the chilli and garlic and stirfry on a high heat for 15-30 seconds until the garlic just starts to turn golden, then add the tenderstem royale stems. Stir fry for two minutes, then add the florets along with the mushrooms and stir fry for a further two minutes until the mushrooms are just softening. Add the prawns and stir fry for a further one to two minutes until the prawns are pink and cooked through. Turn off the heat, then stir through the dressing and three quarters of the coriander. Transfer to deep serving bowls, and scatter with the remaining coriander before serving with noodles. If you’re a fan of heat, finely slice another chilli and scatter over too.